Pirie's original 'Heritage Of Horror'(out of print) has been upheld as one of the best books on horror films and on British cinema full stop. It's long been overdue for updating and reprinting and I'm pleased to say Pirie has returned to his original text and updated it here. Whilst some may find horror films and Hammer horror films a source of amusement or camp frivolity, Pirie brilliantly argues for their inclusion within the Romantic Gothic tradition and he underlines this by devoting one his first chapters to an unpacking of the emergence of the Gothic and its attendant tropes. In 'The Characteristics Of English Gothic Literature' he manages to locate Hammer's key films within an anti-realist agenda. I'm not keen on his strident dislike for the 'realist' films of the 1960s - I find 'A Taste Of Honey', 'Saturday Night And Sunday Morning' et al are amongst some of the finest films made in Britain - but I can see his point that there has been quite a denial of the power of the fantastic and horrific within British cinema. Many films and directors have been ignored or pilloried (the case of Michael Powell's 'Peeping Tom' comes to mind) for no other reason than they have taken a different path to discuss their themes in the cinema. His book also reclaims much of the careers of director Terence Fisher and producer Anthony Hinds and he sees them both as key components of the richest years at Hammer. And he ensures that certain films are given their due as key moments in the return of the Gothic Romantic to cinema - everything from 'Brides Of Dracula' to 'Frankenstein Created Woman'. Here he manages to get across his admiration for the work of both Fisher and Hinds as well as their place within the tradition. He also focuses on other directors, with those employed by Hammer, such as John Gilling and Don Sharp and later in the book such talents as Michael Reeves. The nice surprise is the section on Vernon Sewell where he elevates that director's long forgotten 'Curse Of The Crimson Altar'. He does include more about Fisher, and about the battles with the BBFC and is of the opinion that both James and Michael Carreras more or less oversaw the demise of Hammer in the mid 1970s rather than blaming either one of them. 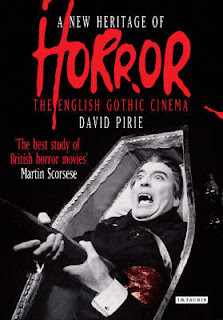 The original volume concluded in 1972, I believe, and from what I've read here he was very positive about the future of horror cinema and as well as updating existing material and revising his views, Pirie examines the period after 1972 when British cinema went through a rapid decline. He goes on to discuss the state of the horror film in the 1980s and 1990s and through to the present day. His own experience as a screenwriter informs the final section on modern horror and again he is very positive that, after the dire slump of the 1990s, British horror is alive and well. The overwhelming sense though is that he advocates the Gothic as the only anti-realist tradition in British cinema and the films that have embraced this are still vibrant and powerful. It's an excellent book but it suffers from some inaccuracies and typos and often Pirie doesn't carry his thesis through completely into his discussion of various periods or films in the tradition. Mind you, I'm utterly delighted that he views 'Scream And Scream Again' as a masterpiece of 1970s British horror.